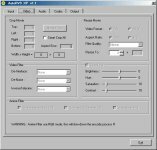 autorv9 is a tool which automates RV9 (RealVideo9) encoding. It use the RealProducer Gold v9.1 and Besweet. It supports both, 1-pass and 2-pass, it can shutdown your computer, it calculates the needed bitrate, it supports .AC3, .MPA, and .PCM file input and it starts the audio encode process to create a stereo .WAV file. It can encode 2 audio streams, support of the subtitles (.srt,.sub) and create .smil file. You can encode end-credits separately too, and split the final file. add support for 2.0 and 5.1 input wav file.